We were blessed with a few summery days on the last May Bank holiday, so I thought I better crack open the Iced Tea before it rained again! Here is my selection Hampstead Tea London's specialist Iced Teas made from fine leaf tea, that is Biodynamic, Organic and Fairtrade. These cute little cartons are recyclable as well and perfect just for you, or to share since you can get a good couple of glasses out of them. I decided to try the Lemon Green Organic Iced Tea for this post and I thought it was a healthier alternative to a cold cola on a warm day as it's low calorie and high in antioxidants and there's nothing as refreshing as lemon! This Lemon Green Iced tea is made from real leaves and is free of preservatives and flavourings, so it really is what is says on the carton. It's made from Green tea, so it was surprisingly light compared to the mass produced Iced teas i've tried before that are often strong and dark. It was slightly sweet and tasted a little like honey, against the subtle bitter note from the lemon, which gave it texture. It also had a lasting aftertaste due to the quality of the tea leaves. If you're used to the American super-duper sweet, sweet Iced teas, then this may take you back a bit as it's light and refreshing rather than an assault to the senses. 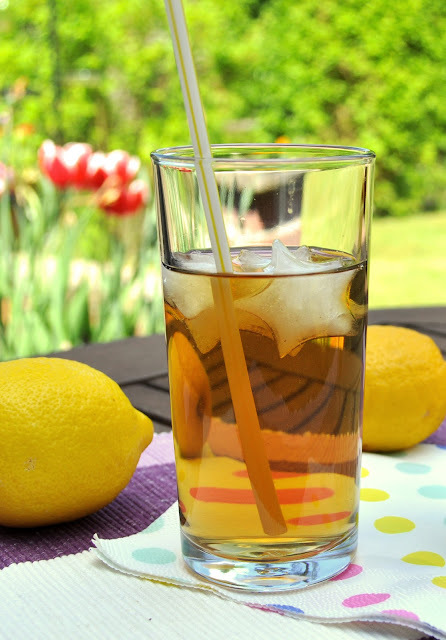 I think Iced Tea is a great way of drinking your tea now summer's officially coming and Hampstead Tea can offer a tasty treat that's healthy for all. These 330ml cartons cost £1.49 online at their store, which is a bargain really. They also have a map here for shops in real life and of course their Facebook page! Watch this space for reviews of the Raspberry and Elderflower reviews, next!